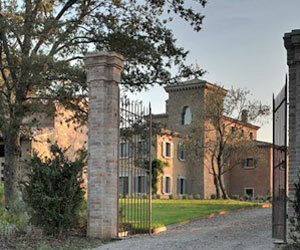 Palazzo is one of ten 5-star luxury villas available to rent on a private estate of Castello di Reschio. This private estate covers 2,000 acres of Umbrian countryside with expansive views of rolling hills, olive groves and vineyards and forests of ancient oak and chestnut trees. Little has changed since St. Francis of Assisi preached here in the Middle Ages. Palazzo is the crowning jewel of the Reschio estate. This large formal villa is located in the heart of the estate. Recently restored to the very highest standards, while it incorporates modern features it stays true to the integrity of a gentleman's country villa. Standing on a commanding knoll with magnificent 360° views it also boasts a formal garden bursting with colorful flowers and heavenly scents, a heated infinity swimming pool with covered loggia, a tennis court and a several outdoor sitting and dining areas to choose from. A twin staircase leads up from the front terrace to the first floor - the Piano Nobile and holds the formal living room. A solid stone tower contains a semi-spiral hand-built travertine staircase leading from the basement to the second floor where the spacious master suite is located. There are 4 further en-suite guest bedrooms, one on the ground floor and three on the first floor. Enter into the large dining room and on the right is a living room with large French windows that open to the terrace, parterre and gardens below. Also on the right is the fully equipped kitchen. To the left of the dining room is a cloak room and a hallway that contains a bathroom and leads to a double bedroom with direct access to the gardens and en suite bathroom and dressing. Up the spiral staircase one flight is a hallway. To the right of the hallway is a large living room with a double external staircase. From the living room is access to two double bedrooms with en suite bathrooms and dressing rooms. Back at the hallway, directly ahead is a home cinema room and to the left is a double bedroom with en suite bathroom and dressing room. To the top of the spiral staircase and to the right is the master suite. The first room is the master study with a partners' desk. Then is the en suite master bathroom with both a large walk through shower and bathtub. Finally is the master bedroom with two en suite dressing rooms and seven south, west, and north facing windows for an extensive, panoramic view of the landscape. Down to the bottom of the spiral staircase and directly ahead is a wine cellar and to the left is a billiards room. Beyond the billiards room is a tunnel that opens into a fully equipped gym and a pool and gym shower room. Beyond the gym is the large infinity pool that overlooks the Reschio Estate. Finally, the pool lounge and bar area is to the right of the gym. Out in the gardens is a private tennis court with a fully equipped pavilion, bar, and spectators box. There is also a laundry house, pump room and staff restroom. • Air Conditioning only in Master Suite and Gym. • This villa is not suitable for children under 14 years.